Pakora or Pakodas are fondly called Bajjias (Bhajias) and are generally deep friend Indian snacks made using besan. Besan is mixed with Indian spices and herbs to get different flavors and taste. Sometimes, even rice flour or hot oil is added to the batter to increase the crispiness of pakoda. Come monsoon and our hearts start yearning for something spicy and crunchy to munch on, that’s when pakodas come into the picture. The ever popular combination of piping hot pakoda and cutting chai is a famous street food of Mumbai. Even those who are very health-conscious cannot resist munching on just a pakoda or two with their evening chaai! Indeed, savoury snacks like pakore are as much a part of our lifestyle as mithai is a part of our culture. Potatoes and onions are the most popular vegetables use to make pakodas. You can also combine aloo with poha to make quick and easy Poha Aloo Pakora. For spinach lovers we suggest Palak Pakora served with piping hot Chai. Here is an irresistibly crunchy and excitingly flavoured pakoda made with cabbage. You can also use yam to make Suran Pakodas. In the mango season, take ripe Alphonso Mangoes cubes to enjoy unique Aam Ke Pakoda. You can even make bhajjias using cauliflower or use an assortments of vegetables to make Mixed Vegetable Pakora. While traveling across the Punjab one comes across the one of the most delicious yet simple snack, Paneer Pakoda. A variation to this is Malwanli Style Paneer Pakora. The Moong Dal Pakoda, with its unique texture, is an all-time favourite sold across Mumbai by street vendors. For those who thought Vada Pav and Pav Bhaji to be the only bread-based Mumbai roadside snacks, Bread Pakoda with aloo stuffing is sure to be an eye-opener. Bread Pakoras with paneer stuffing is a popular kids lunch box recipe. Maharashtrains use a lot of peanuts in their cooking and Peanut Pakora along with some chopped spinach is loved by them. My personal favorite are the Pyaz Ke Pakoda which is served at the top of Sinhagad Fort in the outskirts of Pune. That is the most famous snack there and they are like a treat after accomplishing the climb. Instead of using besan, this unusual Chana Dal Bhajiya made with a mixture of soaked and ground chana dal flavoured with crunchy onions, pungent garlic, fiery green chillies, peppy ginger and aromatic coriander leaves. Urad batter is generally associated with the South Indian vada, but here we have made pakodas with urad dal and it tastes absolutely awesome. Well, nobody would ever be able to guess that this Khichdi Pakora is made from leftover khichdi! Do try your hands on these various vegetarian pakora recipes and let us know how you enjoyed them. 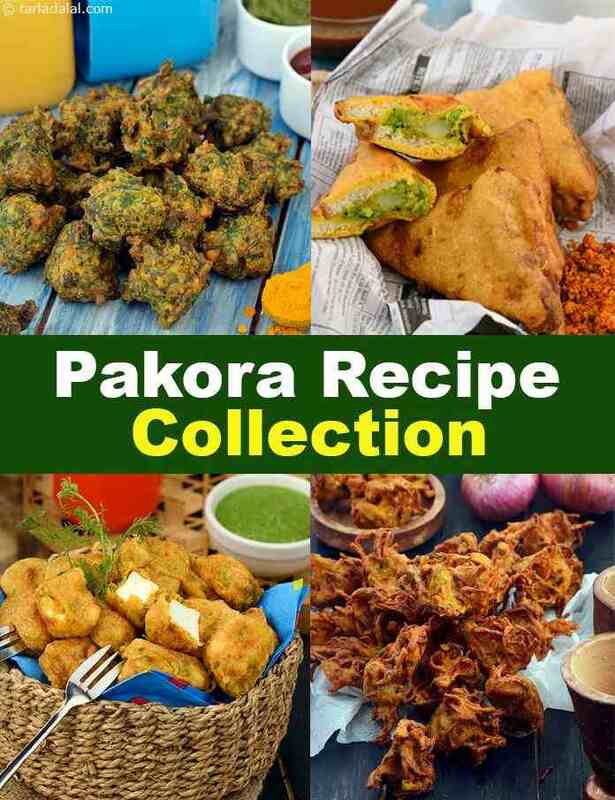 Enjoy our collection of Pakora Recipes down below and don't forget to comment on this article. We would love to hear from you. Bread pakoda, a unique, yummy and healthy paneer stuffing that makes these bread pakodas a perfect short break snack. Remember to pack tomato ketchup as an accompaniment. Easily mistaken for a deformed capsicum, the bhavnagri chilli is usually stuffed with paneer, cheese, potato or even mixed vegetables and then deep-fried. Start off your meal with this crunchy starter. Thanks for the vast collection of my favourite monsoon snack. My kids also love the Veg Pakora recipe.